Investors should stay focused on corporate earnings growth to ride out the short-term uncertainty in the local market. This was one of the key points made by Teng Chee Wai, managing director of Affin Hwang Asset Management Bhd, at The Edge-Citigold Wealth Forum 2018. During his presentation, “Brace for turbulence — positioning ourselves for the long haul”, Teng said that while corporate earnings in the broader market have not been strong, some sectors continue to report solid growth. “If earnings come in at 6% to 8%, I think that will hold the market up to some extent. I see banks delivering very good earnings this year, which explains why we have seen a lot of interest in banks so far,” he added. Last year was a stellar one for Malaysian banks. CIMB Group Holdings Bhd, for instance, announced that its net profit for FY2017 ended Dec 31 soared 25.5% to hit RM4.47 billion — an increase of almost RM1 billion from 2016. This was just shy of the group’s all-time record of RM4.54 billion, achieved in FY2013. Public Bank Bhd posted record earnings of RM5.46 billion last year, up 5% from RM5.2 billion in 2016. From a broader market perspective, earnings have not been strong. While the FBM KLCI is up 4.13% year to date (as at March 20), the FBM Small Cap Index is down 8.96%. 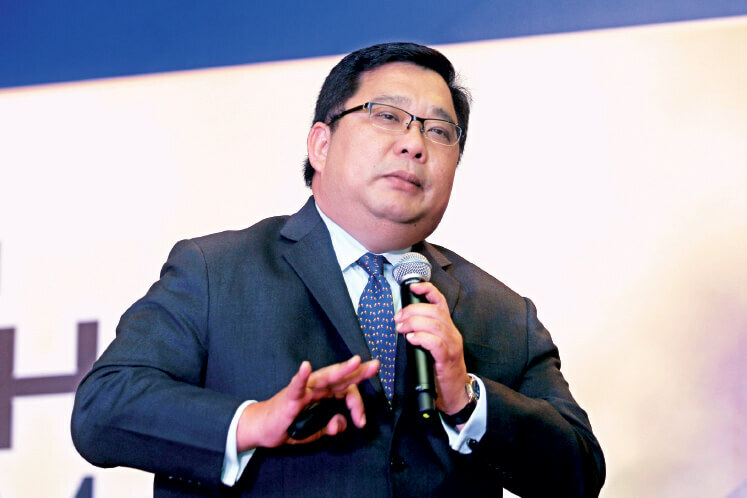 “Some 98% of the funds underperformed over the last two months because the narrowness of the market performance is such that if you are not in banking or large-cap retail stocks such as Nestlé or Carlsberg, you are gone,” said Teng. He added that by now, the traditional pre-election stock market rally would have been long gone. “Looking at the historical data, we find that the best time to invest in the stock market is eight months before the general election. If the election is called next month, then you have missed the boat and I advise you to not jump into another boat that may sink!” he quipped. On the country’s upcoming 14th general election, Teng took a pragmatic view, saying that the market is counting on continuity in government. “I get the sense that the government will remain unchanged. And since it is going to play out like that, I do not expect any surprises in the marketplace post-election,” he said. To offset these pockets of uncertainty, he advised investors to maintain defensive positions in their portfolios, for instance, by holding on to larger cash positions. “This should be the year for investors to remain diversified, whether by geographical coverage, sector, asset class or currency. How much you want to put into equities versus fixed income depends on how much sleep you want to have at night,” he said. A particular area of concern has to do with US President Donald Trump’s ongoing protectionist agenda. “I get uncomfortable talking about this because I am not sure if the tariffs he has implemented have been fully priced in by the market,” said Teng. In the longer term, investors should look at the tech innovations as the companies in this sector will be the big winners. “If ever the markets come off short, buy the likes of Alibaba Group Holding Ltd and Tencent Holdings Ltd,” said Teng.